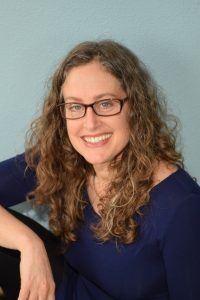 What is your book about and why did you write it? I got this crazy idea – to pull the kids out of school, rent out the house, and take the family on an eight month pilgrimage through India and Nepal. The good news was that my husband had spent a year in India in his twenties, and was open to my wild scheme. In the places where the Buddha lived, in the Himalayan village H.H. the Dalai Lama calls home, in the ashram of Amma the Divine Mother, we would get insights into the true nature of reality, and get perspective on the purpose of this beautiful, precious life we have been given, which I felt I was wasting by running like a hamster on a wheel. So we did it – we took our remarkable voyage. With backpacks on our shoulders, we criss-crossed India by train, bus, and rickshaw. We trekked in the Himalayas, walked along the Ganges in Varanasi, and lived in the jungles of Kerala. Our daughters Bella and Sophia, then ten and fourteen, were intrepid travel companions, and brought such a richness to our travels, because people love children where ever you go. Of course the journey transformed us in ways we never expected. Then we returned home and I was faced with life returning to “normal”. When people asked “How was India”, I couldn’t possibly explain – so I started to write this book to answer that question. “We write to taste life twice – in the the moment and in retrospect”, Anais Nin wrote. 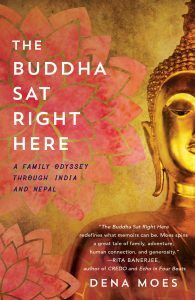 I found that writing The Budhha Sat Right Here deepened my understanding of what happened on our whirlwind adventure, and the writing became a journey of its own. What inspired your family trip to India and why did you choose to visit India? I have felt a deep spiritual connection to India since I was twenty, and it had always been my dream to go there. As a young woman, yoga saved my body, and then Buddhism saved my mind. The Buddha was born in what is now Nepal, but he lived, and awakened to Buddhahood, and taught, in India. I met my husband Adam when I found him sitting under a tree, meditating. He had just gotten back from India where he had studied with Tibetan Buddhist masters in rather extraordinary circumstances. Watching him meditate, my first thought was “Whatever he is doing, I should be doing that too.” I sat down beside him and our amazing partnership began. Our plan was always to go to India together, but babies, house, and businesses followed one after the other. We put off our India travel dreams. Then a remarkable thing happened – my sister, a foreign correspondent living in New Delhi, gave birth to her daughter there and I went to visit her. When I returned, all I could think about was going back, for longer, with the family. “India is a fire in my blood”, I would tell people. India is a fire in my blood.The only way to put out that fire was to go back. What was the hardest part of the trip? What was the best? The hardest part of the trip was definitely managing the family dynamics of the four of us traveling together, sharing one room in a guest house most of the time, and basically doing everything together for eight months. We had an an angsty fourteen year old who had a brilliant knack for finding and analayzing the flaws of everyone and everything, a bouncy, imaginative ten year old who loved to give us the slip and get lost, and Adam and I – who loved each other but had fallen into some pretty terrible patterns over the stressful years of parenting, and had relationship issues ready to bubble up. What could possibly go wrong? Above all, the best part of the trip was being able to focus on my spiritual life, something that always got put on the back burner at home. This was a pilgrimage, and we traveled with the intention to get closer to the heart of what really matters. Ultimately we are made of star stuff and our true nature, with all the illusions torn away, is love and wisdom. We took a break from our ordinary lives because the truth had been covered over by habit patterns of distraction. Travel, getting out of the usual routines, created space for transformation, and like layers of an onion, that which is not true was peeled away. You are Buddhist and considered the trip a pilgrimage of sorts. Will you go to India again? How did this trip deepen your faith? India deepened my faith in so many ways. When you spend time in holy places, such as Bodh Gaya were the Buddha sat under the tree, people are there for pilgrimage, like you. Everyone you meet helps to lift you up. We made friends with monks and yogis of many stripes and lineages, and their friendships with us filled our days with teachings and inspiration. In these holy places, no one is gossiping our talking about their latest shopping spree – the collective reverence and devotion elevates us all. Then, we had the good fortune of attending teachings with great masters in India, such as the Tibetan Karmapa, the Dalai Lama, and Amma the Hugging Saint. We also received teachings from lesser-known masters whom we met along our journey. In Dharmasala, the Himalayan town where the Dalai Lama lives in exile, we attended a month- long seminar with a Buddhist teacher named Chamtrul Rinpoche. Spending this much time studying esoteric Tibetan tantras was a precious gift, right in the middle of raising children. After class I would go sit meditation in the Dalai Lama’s temple. I touched a deeper, truer part of myself than I had felt for years. Our six weeks in Dharamsala were transformative for our whole family. I felt that the monkeys in the trees showed me where I was coming from, and the monks showed me where I wanted to go. And the rugged conditions of travel in India – the crowded, chaotic train stations, and long bus rides in hot, packed, buses – afforded us the perfect opportunity to put the teachings into practice. 5. Did this trip change how you parent? Were those changes applied to daily life when you returned to the United States? I would say that the trip helped me be more peaceful, open, present, content. These are the qualities one gains by spending time in the sacred places of India, in the company of the wise. Less driven by “shoulds” and worries from external pressures, I have been able to parent in a way that is more balanced, flexible, and respectful of my kids’ genuine needs as well as my own. 6. What were some of the challenges of traveling with kids? Some of the joys? Traveling with kids is the best. First of all, people were so friendly to us everywhere we went, and I am sure our darling children had a lot to do with it. People love children the world over, and in India they were amazed to meet American children. There are NOT many American children traveling around India. We were sort of an oddity, and given warm welcomes and open doors again and again. We would also get thronged by children wanting to meet and shake hands with our daughters, and people wanted to take pictures of us all the time, too. “One snap, please, one snap?” They would say, aiming their cellphones at us. I felt it was a fair trade, since we were taking pictures of them and their country, too. Our kids are intrepid travelers. They grew up camping, and going to places like Rainbow Gatherings and even Burning Man with us, so they knew that magical places and challenging living conditions often go hand in hand. They were up for the adventure. I loved having this time with them, spending quality time with them instead of just driving them here and there, and nagging them about homework and bedtime. The biggest challenge was when little Sophia got dysentery in Kerala. Another time, we all caught a flu in rapid succession, in a po-dunk town we found rather ghastly, in Rajasthan. We couldn’t leave, because as soon as one of us got better, someone else came down with it, and became too sick to travel. So we were quite stuck. That episode didn’t make it into the book – consider it bonus material. Dealing with sick kids is no fun at home or while traveling. 7. Do you have any tips for parents wanting to travel to India with their own children? YES. Do your homework and learn about the seasons in India. India has three main season, the dry, the hot, and the wet (monsoon). Plan your itinerary around the ideal season for each location, and everywhere you go, you will be just in time for the amazing, once-a-year festival or event. This happened to us so often I almost called my book Just in Time! Also – pack light! Buy Indian clothes to wear when you get there so you fit in, and don’t bring more than you can comfortable carry on your back. Remember, you can buy anything you need, for cheaper and better, as you go. Except toilet paper. Keep a wad of it with you at all times. People want to know it my book is just for Buddhists. My book is for anyone who dreams of travel, for parents who thirst for adventure, and for people who are open to seeking meaning in their lives beyond the acquisition of material things. What I learned about Buddhism is woven through the memoir, but the themes of love, compassion, and peace are universally relevant.